At ShuttersUp, we don’t make shutters for windows. We make shutters for people. Let’s work together to realise your vision for your home, with beautiful plantation shutters made up to your exacting standards, down to the very last detail. There’s a never a bad time of year to have shutters in your home. In summer, they keep rooms cool, shaded and ventilated. 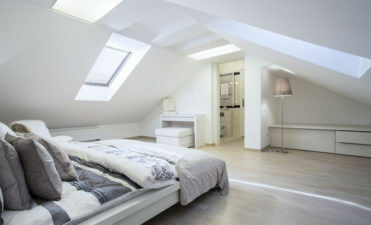 Then as the cold dark nights draw in, they create a uniquely warm and cosy atmosphere in your home. Close your shutters at night to give your windows the best insulation money can buy… and make potentially big savings on your heating costs. One study found that wooden shutters can reduce heat loss through a window by up to 51%, compared to just 14% for curtains. 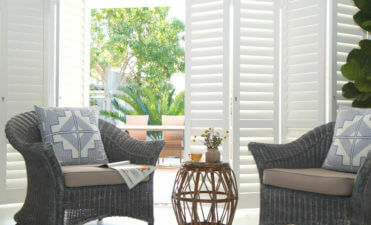 Our plantation shutters can fit just about any window, door or gap you can think of. We even provide custom-made shutters for unusual and odd window shapes, from circles to triangles to arches. Window shutters are the allergy sufferer’s friend. Where curtains and blinds harbour hard-to-clean dust and allergens, shutters are wipe-clean and hygienic. Shutters don’t just put you in charge of how light your room is. They also act as a natural noise barrier in street-facing rooms and urban homes. With privacy as with so much else, shutters put you in charge. Different shutter styles offer different degrees of privacy, but nearly all let you obscure your eye-level living space without plunging the room into darkness. Like our shutters, our work process is designed around you. Every time you meet us or speak to us, you’ll be dealing with a fully trained ShuttersUp employee whose ultimate job it is to get you one step closer to your ideal plantation shutters. Our first home visit is our chance to get to grips with your project and recommend certain options and features. No hard sales. No pressure. Just helpful guidance from a shutter expert on how to achieve the look you want for your budget, finishing with an accurate quote. If you’re happy with our proposal, it’s time to sign up. Our online contract system gives you all the information you need to review every last detail of your order before signing. If you have any more questions, now’s the time to ask. We want you feeling excited not confused about your new shutters! When your shutters are ready, we’ll call you to book in your installation. 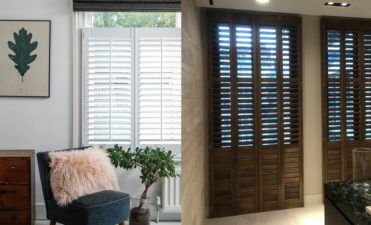 On the day, your fitting team will arrive on time (or call you if they’re stuck in traffic), then fit your shutters with minimum fuss and maximum care. Afterwards, they’ll show you how to operate your new shutters, before leaving your home exactly as they found it. If you have an issue or question once your shutters are installed, don’t hesitate to get in touch. We hope your fitting is the first of many, so we’re always happy to hear from you. Remember that your shutter panels are covered by a minimum 3-year warranty, so most problems are easily fixed.